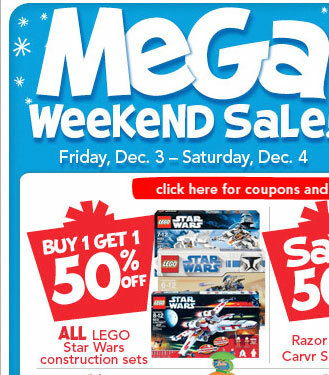 And we have another holiday LEGO sale at Toys R Us, or rather a coupon. It’s a typical Buy 1, Get 1 50% off coupon, however this time it’s only for one line, and it just so happens to be for the Star Wars line! Normally Star Wars (and Harry Potter) are excluded from these deals. Of course there is a limit – one coupon per person, and it is in-store only. There are no disclaimers about particular sets that I could see in the email I got from Toys R US – it seems to be valid for all Star Wars sets. Note: The coupon is good only for tomorrow, Friday December 3, and Saturday, December 4, and is limited to in-store and, and the fine print says Toys R Us reserves the right to limit quantities of items sold. My guess, you’ll see a lot of older sets out on the shelves. So if you are on Toys R Us’ mailing list, check your email for this coupon. You’ll have to click on the ad within the email to get a link to the PDF coupon.